Pictured above is Tom Donahey who has been a member of the SSRTA for 5 years. He lives in Pleasant Gap with his wife Janie, and son Beau, and is the owner of Sunset Trophies. Janie works at Restek Corporation in Bellefonte and Beau at Rider Auto of State College. Tom held the office of Treasurer for 2001-2002 for SSRTA and did a fine job. 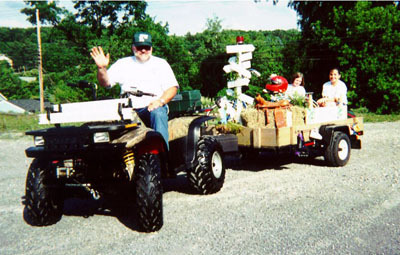 He has been the major coordinator for SSRTA’s participation at the Red Moshannon Canoe Race for the past 4 years. Tom enjoys hunting, camping, and ATVing with his friends and family and especially enjoys riding the SSRTA. He loves being able to see the scenery and wildlife along the trail. Tom was involved in a tragic car accident that took one leg and badly injured the other, quite a few years ago. He has found ATVing the best way for him to enjoy the outdoors and get around. He has been a dedicated supporter and member of the trail and has always assisted with clean-ups each year. Last year he assisted with the tie-removal from Rock Run and Black Moshannon Bridges.